This grant supports Bikay to improve CBT website, "impactexplorer.asia" and develop two mobile applications on Android and iOS operating systems to help the local and international tourists access online and offline features to improve planning and traveling challenges in Cambodia. 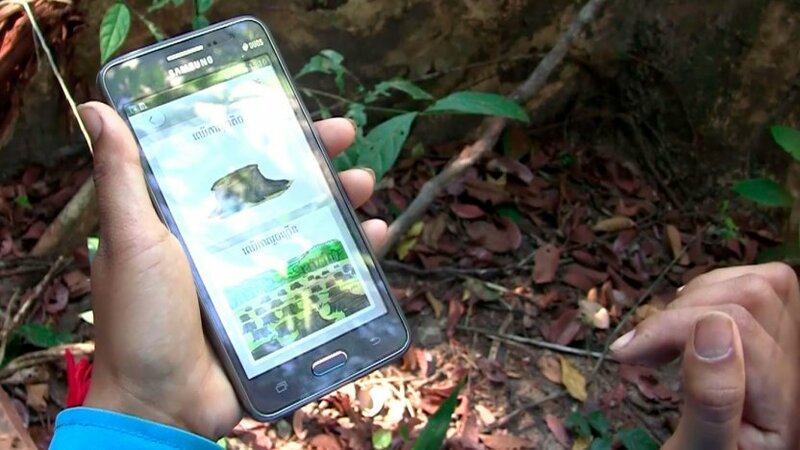 This grant supports NGO Danmission to improve the existing forest monitoring application to reach the Preah Rokar Forest Community Network (PFCN) and improve user experience and reporting. This grant will support InSTEDD to implement the project titled “Scale Up of Trey Visay - Supporting Youth Careers & Futures in Cambodia”. The project aims to connect young people to information about career counselling and vocational training through the Trey Visay mobile app. The project helps ensure that young people they have increased access to tools and resources to better prepare for their careers (Trey Visay means compass in Khmer). Feature Story: Our partner InSTEDD iLab Southeast Asia, and director Channé Suy Lan, are featured in a recent podcast by Social Innovation Asia. Listen to hear more about their story, and their work in Cambodia. This project funds Khmer Youth Association to re-design a user- and mobile-friendly website, upgrade ICT equipment and software to produce higher quality digital content, and improve staff capacity and skills on tech usage and management, focusing on video production and social media communications. The goal of this project is to encourage more young people to become more active and informed citizens by improving social media and online content to be more user-friendly and engaging. This project funds Pact Cambodia to integrate the lessons learned from the initial results of TRANSMIT - a tool that tracks citizen complaints and government responses online - to design, develop and field-test a new prototype with target user groups using deeper user testing methods. The overall goal of this project is to validate a better technology solution that will enable effective and constructive engagement between citizens and government officials at the local level. This project is a collaboration between People In Need & DAI Maker Lab, with technical assistance funding from Development Innovations to support the development of an open-source flood early warning tool. This pilot project had two goals - 1) to develop a viable open source design suitable for scaling to other key locations around Cambodia to establish a national flood information network, and 2) to introduce the principle of open source hardware for development to stakeholders in Cambodia and build some basic skillsets for participating practitioners. The device, called Tepmachcha (https://github.com/DAI-Maker-Lab/tepmachcha/wiki), is a sonar stream gauge that, mounted on a fixed point over a stream such as a bridge, can determine the water’s height and send that information over a mobile phone network to the cloud for logging (http://ews1294.info/sensormap). If the stream’s height exceeds a warning level, Tepmachcha triggers an alert on PIN’s IVR system. The tens of thousands of IVR subscribers in the Tepmachcha pilot area will get a voice telephone call within a matter of minutes alerting them of the flood condition. This project funded the improvement of an online mental health information and virtual counseling resource for young people through Facebook's Free Basics platform. The main format for the My Tree of Life (MyTOL) website included mental health information postings and discussions, and online Q&A sessions. This project developed a website that serve as an online directory of social enterprises and information resource for developing social enterprises in Cambodia. The website provided practical resources and information about social entrepreneurship, highlighted and promoted innovative solutions to social/ environmental problems, and provided a directory of social enterprises for potential investors and donors. This project empowered Prey Lang communities to tell their stories through community-based media production activities, and BPO collected these stories and created content from people from five communes to broadcast online. Ultimately, these stories helped raise awareness about citizens' issues in Prey Lang at the local and national level through social media and online radio. This grant supports the Lake Clinic to translate and implement a popular, open-source clinic management system. The project will help tested whether the CRM system works for Cambodian clinics and patients and helps improve service delivery. Following the pilot, The Lake Clinic will present this model to the Ministry of Health. The project funded the development of an online platform which allows youth to debate key topics digitally. Through this, youth voices are strongly joined for advocating for what they actually demand from main actors, especially the government. This grant supports CCC’s implementation of the Digital Data Collection and Visualization for M&E project. This program was developed to design and pilot a replicable and sustainable Digital M&E Support Package that equips organizations with the ability to efficiently collect, manage, and conduct basic visualization of M&E data with mobile and cloud-based data management systems. The project funded the update of a paper-based citizen concern system to promote mobile reporting. The reporting tool provided faster feedback about interventions and updates and allowed MEDIA One to integrate community concerns and questions their radio show topics according to citizen input in near real-time. This project tested a tool to make public service prices more available through interactive voice response technology (IVR), which enabled access to audio information files offline without incurring data charges. Initially, it makes available the prices of public services and then expand over time to provide additional information based on citizen priorities. This project funded a website to provide educational resources for teachers, school directors, District and Provincial offices of Education (PoE/DoE) and parents. Through Facebook's Free Basics platform, the site aims to reach marginalized and out of school children, and connect them to online resources and school-based resources. This project funded Rotati Consulting to create CamboSearch.org, a go-to online directory and resource where organizations can search for and find relevant technology and service companies that can help with their technology needs. The directory lists service providers that produce technology (i.e. websites, apps, databases), create content and conduct training on new technologies. This project funded a platform to track citizen issues and government response online, and tested the development of a digital tool to track and share information about citizens' priorities at the commune level. This project funded the development of TosFund, meaning Let's Fund in Khmer, an online fundraising and crowdfunding platform for Cambodia. The funding tool built campaigning capacities for development initiatives (especially for Cambodian CSOs), provided practical payment outlets for civic fundraising efforts, and helped test online fundraising tools through Cambodia-based payment systems. This project supported the design and development of a tool for Cambodian Center for Independent Media's citizen journalists (CJs) to collect, report, and track local issues from around the country. The reporting tool aimed to increase coverage of these local issues by linking Cambodian and international media outlets to these stories quickly and efficiently. The project funded a safe and reliable digital storage solution for DC-Cam’s digital archive of historical materials. The archive includes photos (20,000 historical photos & 157,000 field trip photos), videos (108 Khmer Rouge regime videos & 318 interview videos with Khmer Rouge cadres & survivors), audio (4,499 interview audio with Khmer Rouge cadres & survivors) and written documentation (14,567 documents equal to a total of 100,503 pages) from the Khmer Rouge period. This project focused on the development of a mobile application by social enterprise ALiEN DEV to improve speed of typing in Khmer script. The app allows more Cambodians to communicate via mobile phones in their native language. A research project with Open Institute to define the priorities, the strategy, the tools and the work that needs to be done to achieve high quality Optical Character Recognition (OCR) technology for Khmer. OCR technology would enable indexation of large amounts of information in Khmer language and make scanned documents searchable. This project funded the development of a digital literacy assessment tool for the Total Reading Approach for Children (TRAC) project's Continuous Assessment System (CAS). The assessment app promoted teacher understanding and used of the CAS as a diagnostic tool for student learning. The CAS App also facilitated teacher and student use and understand of technology in the classroom.